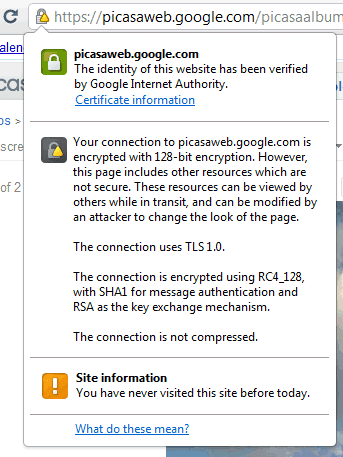 Picasa Web Albums was one of the few Google apps that didn't support encrypted connections. Now you can go to the secure version at https://picasaweb.google.com to make sure that no one can intercept your requests. This is especially helpful if you use an unsecured WiFi connection. Many Google services support HTTPS connections: Gmail (enabled by default), Google Reader, Google Groups, Picasa Web Albums, Google Search, Google Finance, YouTube (partially encrypted). Other services only support encrypted connections: Google Calendar, Google Docs, Google Sites, Google Health, Google Analytics, Google AdSense and AdWords, Google Web History, Google Bookmarks, Google Voice, Google Latitude, Google Checkout. It's probably easier to list the services that don't support HTTPS. I wish there was a way to use it by default - like with Gmail. Even worse is the iGoogle gadgets don't use it and the title links that take you to the full web-app don't use the https link so it's really cumbersome for me to make use of it. I paid for extra storage and was using picasaweb to host my ebay pictures. Not anymore unless I can figure out how to get a regular http link to a picture. Upsets me when developers break stuff...how hard to offer an option for creating links that don't use SSL? Is there a special reason why you don't want to use (or you can't use) the HTTPS links? This is fantastic. I was looking for this feature for many months, and now it is completed. The problem with the caching remains, however this is a minor issue.